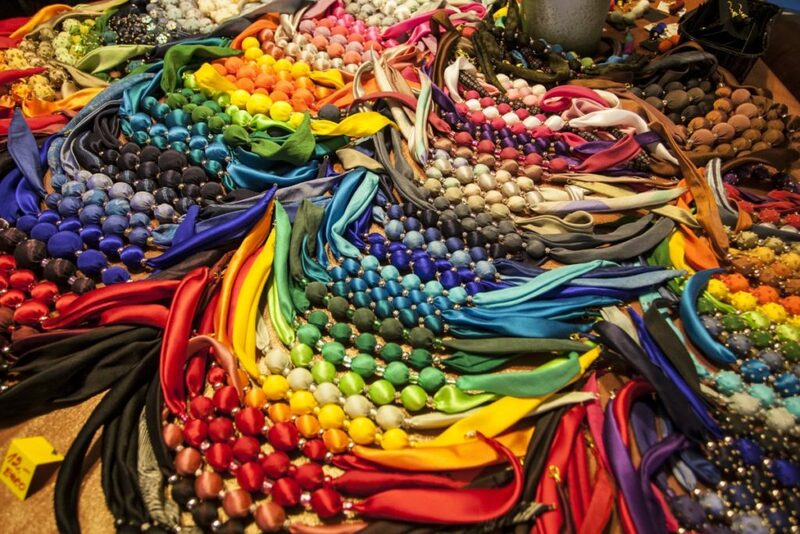 The trademark of the shop is hand painted silk of Aita Rõemus – subtle colorful silk scarves, vain ties, necklaces and earrings with pearl embroidery. Silk painting is often considered as a modern ad fashionable hobby but actually it is an ancient form of art that originates from the East. Silk painting made it to Europe through the court of the Russian tsar. In France hand painted silk became popular in the 1920s; silk paintings became a separate form of art in 1970s. There is some kind of special sensual attraction in silk paintings where luxurious material meets with handicrafts. You can find in the shop unique medieval clothes and dresses of land ladies made by Aita Rõemus, which have been inspired by the paintings of the 14th – 16th centuries. In “Interim Authority” shop you can also find ceramics of famous Estonian artists Kersti Karu and Mare Vichmann; a selection of hand painted cookware of Ars Portselan and other products of craftsmen. We take bookings for silk painting workshops.